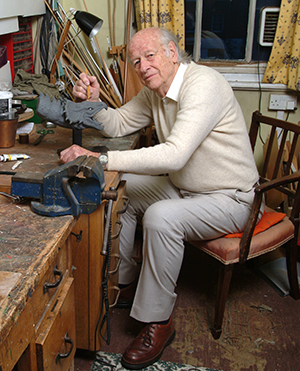 Ray working on a bronze sculpture in his workshop in London. The Foundation welcomes any sponsorship from any individual or organisation. Any sponsors will have their name or logo on this website and on any future exhibitions where they have helped either financially or with facilities. See the Contacts page for more information on how to contact us. Donations from fans, friends and filmmakers. If you wish to make a donation under £1,500 to this charity then please do so via PayPal using our account name rayharryhausenfoundation@gmail.com to do so. For any amounts over £1,500 please contact us at either connor@rayharryhausen.org.uk or write to the contact address given in the Contact section. You can nominate the money to go to either the upkeep of the collection, the Ray Harryhausen Scholarship or to conservation. If the latter then you can select a model that you wish the money to go to but we cannot guarantee this although we will attempt to comply with any individuals wish. We welcome anyone who wishes to become a patron of the Foundation. The only proviso for this are that the individual or organisation will need to have contributed in some way to the ongoing work of the Foundation.